About the talk – In Papua New Guinea, the fate of forests is governed by forest-dwelling tribal societies. A rapidly increasing pace of logging compels us to ask why tribal communities prefer logging to conservation. In the absence of feasible development opportunities, remote communities become quickly enthusiastic about conservation projects, but once an area is opened up to logging few such projects survive. Direct payments to forest owners to cover the costs of missed opportunities for economic development are advocated here to make conservation competitive. A conservation royalty scheme would deliver a higher proportion of the conservation funds to the resource owners than the management-intensive community development projects currently favored. Such an approach requires a profound cultural change within conservation organizations from a ‘development aid’ approach to one more oriented toward business. About the speaker – “Vojtech Novotny is a tropical biologist. He is Professor of Ecology at the University of South Bohemia and the Head of the Department of Ecology and Conservation Biology at the Biology Center of the Czech Academy of Sciences in the Czech Republic. He is leading an international team of researchers studying relationships between plants and insects in tropical rainforests. This work has provided, among other results, the currently accepted estimate of the number of insects living on our planet. Novotny is directing the New Guinea Binatang Research Center, a research station in Papua New Guinea, recognized for its ecological research, which successfully unites western scientists and the tribal peoples of the New Guinea rainforests.” – from the Google Books entry for “Notebooks from New Guinea: field notes of a tropical biologist” (available at Amazon.com). About the talk – “Marine ecosystems are experiencing unprecedented rates of biodiversity loss around the world. Habitat areas are prioritised for conservation on the basis of the species they possess, and conservation programmes are assessed on the species preserved. However, without an appropriate classification scheme grounded on evolutionary history, errors in estimates of diversity are inevitable. Recent phylogenetic studies on scleractinian corals demonstrate precisely that. Based principally on gross morphology, traditional taxonomy suffers from the lack of well-defined homologous characters that can sufficiently describe scleractinian diversity. One of the most challenging clades recovered by recent analyses is ‘Bigmessidae’, an informal grouping that comprises four conventional coral families, Faviidae, Merulinidae, Pectiniidae and Trachyphylliidae, interspersed among one another in a big mess. I will describe part of my PhD study aimed at reconstructing the evolutionary history of this clade. I present a robust molecular phylogeny based on five DNA sequence markers gathered from 76 of the 132 currently recognized species collected from five reef regions around the world. As expected, nested within ‘Bigmessidae’ are four conventional families as listed above, and relationships among them generally corroborate previous molecular work. This more resolved phylogeny supports several groupings that cannot be explained using macro-morphology, but are reconciled by subcorallite features of the skeleton. Wide geographic sampling in this study has also revealed more instances of possible cryptic taxa confused by evolutionary convergence of gross coral morphology. Results therefore support the assertion that diversity estimates of scleractinian corals are erroneous. Fortunately, the recovery of most genera with only minor degrees of paraphyly offers some hope for impending taxonomic amendments. Subclades are well defined and supported by subcorallite morphology, providing a robust framework for further systematic work. About the talk – Insects, with an estimated 10 to 30 million species, are the commonest organisms on land. Although they were assumed to be absent in the sea they can actually be found in a wide variety of marine habitats, including the open ocean. Some 1,500 species of marine insects belonging to more than 10 Orders have now been listed in the World Register of Marine Species (WoRMS) database. I will introduce some of the commonest or most unusual species and briefly discuss their biology, distribution and habitat requirements. Their most important habitats are the intertidal and mangrove which are heavily impacted by coastal development and global warming. At least 2 coastal sea skaters have been officially listed as endangered species in Japan. More are either threatened or likely to face extinction. Although we are not aware of any economic importance for any marine insects, some are of potential use as indicators of climate change or environmental pollution. Conservation of mangroves will serve many important functions besides preserving the most important habitat for many marine insects. About the speaker – Dr. Lanna Cheng obtained her D. Phil in insect ecology from Oxford University after graduating from the University of Singapore. She became interested in marine insects when she joined the Scripps Institution of Oceanography (SIO), University of California, San Diego and edited the book “Marine Insects” which remained the only scientific reference on the subject. She is a Full Research biologist at SIO and is actively engaged in several research projects on Halobates, the only known insect living in the open ocean. I am a postgraduate student from the Terrestrial Ecology Lab working on fig-fig-wasp mutualism. Right now, I am looking for an undergraduate student to start work immediately to sort fig wasps from other arthropods such as ants, flies and spiders. You will be taught to differentiate fig wasps from other arthropods, so no worries there. Wages: Standard hourly wages for part-time students assistants. If you are interested, do drop me an email at g0700563@nus.edu.sg. This year NUS started a new Joint Degree PhD Programme with Imperial College London. Amrita Srivathsan from the Evolutionary Biology Laboratory is one of the five students from NUS selected for this prestigious programme. Congratulations, Amrita! This joint initiative allows students to benefit from the ‘expertise of two academic research groups with complementary strengths or engaged in an inter-disciplinary collaboration’. Under this programme, students will spend time studying in labs from both NUS and Imperial College London. A joint PhD degree is then awarded by both institutions to the student. Amrita’s PhD project will be a synergistic fusion of high-tech sleuthwork and good ol’ fieldwork. She aims to determine whether next-generation sequencing can help with conserving tropical biodiversity. This is important for Singapore’s natural heritage, especially when such tools could potentially be used to study the feeding ecology and other biological information of threatened species such as Banded Leaf Monkeys. Her study will involve a combination of molecular work and computational tools from both the institutions, as well as trundling through our forests collecting samples. She will be supervised by A/P Rudolf Meier in NUS and Prof. Alfried Vogler in Imperial College London. So lets wish her the best! TEDxNUS was incredibly successful thanks to some wonderful organisers and an enthusiastic, supportive and appreciative audience. If you missed it, don’t worry, the whole event was recorded by some of their brilliant tech guys and will be coming to YouTube eventually. Sivasothi aka Otterman talked about conservation in Singapore and featured quite a few of our budding undergrad biologists doing their part to better understand Singapore’s wild fauna. Siva will reprise this talk (albeit in 15 mins) for Green Drinks Singapore in January. John van Wyhe, a Bye-Fellow Christ’s College, Cambridge, and now Senior Lecturer for the depts of Biological Sciences and History is also the director for The Complete Work of Charles Darwin Online. He talked about common misconceptions about Darwin and his work. PhD student Ang Yuchen discussed how sexual selection has given rise to such a wonderful array of sexual dimorphism. As well as the dunking of still-mating flies into liquid nitrogen. Yu Chen will be giving a similar talk this Wednesday evening at Bl!nk BL-NK @ the Blu Jazz Cafe. Details can be found here. Do check out ALL the talks when they are online once again (they were on ustream temporarily), they’re all excellent., e.g. Don Favareau talks about biosemiotics and how it helps pave a bridge between the visually and aurally impaired people and us. Another by John Miksic on archaeology and the lost history of Singapore is another eye opener. 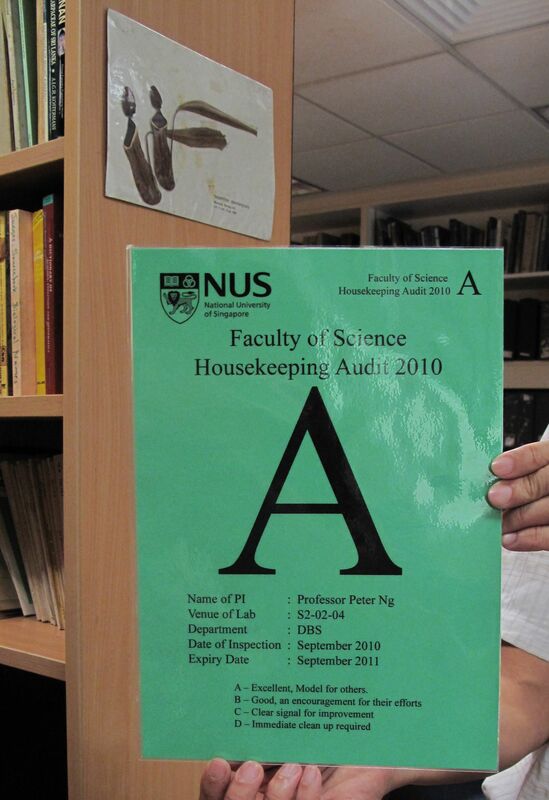 Despite our best efforts, Ecolab received an A in the latest FoS Housekeeping Audit – our first ever!